As stormwater flows off driveways and streets, it picks up and carries most of the items in its path. Things such as grass clippings, driveway salt, fertilizer, pet waste, trash, and more! Read on to learn about some common sources of stormwater pollution and ways that you can prevent pollution in your lakes, rivers, and streams. Pet waste that is not properly disposed of can lead to many unwanted things in our waterways, such as E. coli, parasites, and other harmful bacteria. When stormwater runs over pet waste, it carries it to the nearest catch basin and then flows directly into the nearest waterway. E. coli is bacteria that lives in the lower intestines of warm blooded animals, like dogs and people. It is also present in waste. When E. coli gets into our water where we fish and swim, it pollutes it and can make us sick. To properly dispose of pet waste you should bag it and dispose of it in a nearby trash receptacle. Pledge to pick up your pets waste and receive a FREE pet waste bag dispenser! When washing your car, choose a car wash facility or wash over your lawn or other permeable surface. Car wash facilities have overflow systems where the soapy water will enter the sanitary system and is then treated before entering waterways or being reused. Grass will soak up and filter pollutants from car wash runoff before entering the storm drain that leads directly to the nearest lake, river, or stream. People love their yards, and they often do quite a bit of work to care for them. They mow their grass, water, weed, and fertilize their yards to keep them looking green and uniform all summer long. Another common stormwater pollutant is phosphorus which can be found in many common lawn fertilizers. Too much phosphorus can create harmful algal blooms in water bodies which can make people, fish, and other animals sick if they swim in, or touch the water. Fertilizers have three main ingredients, Nitrogen (N), Phosphorus (P), and Potassium(K). However, phosphorus is not actually needed to grow a healthy lawn. Alternatively, you can keep grass 3 inches in height. This height will allow the grass to soak up more water, reducing the stormwater runoff from the lawn, which that means less watering and using less or no fertilizer. Using phosphorus-free fertilizer (where P=0) is another good practice. During winter time we often shovel and throw salt on our driveways and roads to reduce icing and make it safer to drive on. Many don't realize however, that all the salt, dirt, and sand that is collected in that snow and on those driveways and streets, ends up flowing into the catch basins and into our water bodies, polluting them. 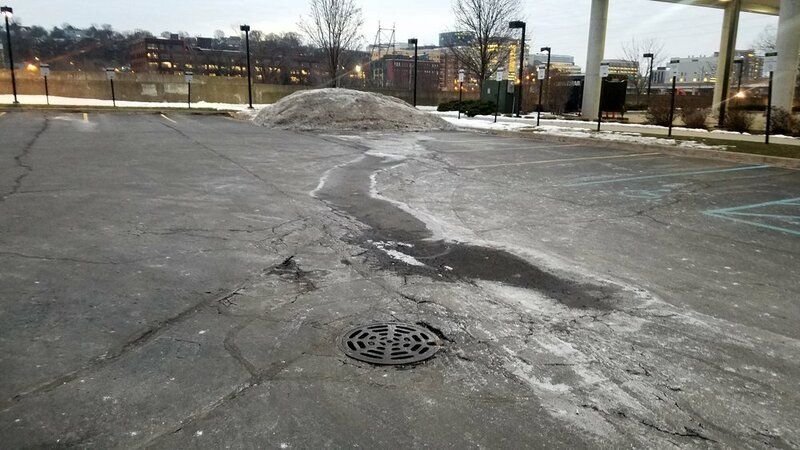 Dirt and sand build up in the bottoms of the catch basins, causing them to fill and no longer accept stormwater, which in turn can flood streets. The sand and dirt that is suspended in the water ends up in the water ways and creates sediment build-up which displaces fish and other aquatic life. The salt that flows into the river is almost impossible to remove and makes the water uninhabitable for some marine life. Large snow piles formed over the winter collect dirt, sand, and trash. When the snow finally melts, it carries all of that into the catch basin. So, what can we do? We can shovel our driveways and roads prior to salting them. This will make it so they require less, if any, salt. We can move snow piles into grassy or other vegetated areas so that the water will be absorbed into the ground and recharge as ground water.